Gettysburg was the site of one of the bloodiest and most decisive battles of the American Civil war, it is also one of the most haunted and attracts people from all over the world in search of the paranormal. During a 3 day period from July 1st to July 3rd 1865 there were almost 50,000 casualties including more then 10,000 dead. Throughout the town and battlefield bodies from both sides lay unburied for months and many where never identified. Although extensive efforts were made to ensure the soldiers received proper burials it is thought that some still remain forgotten. After a 3 hour drive from Baltimore airport I arrived in Gettysburg at about 8 pm, and it was already dark. I came in via Baltimore Street that leads into the town center and although the main battlefield lay ahead of me, fighting also took place in and around the town itself. Much of Gettysburg has been built on since then, so many of the more modern buildings are standing on what was once also battlefield. I was here for 3 nights the first two I would be staying at the Holiday Inn and the last night at The Farnsworth Inn, at the Sarah Black room which was supposed to be the most active of all the Inns haunted rooms. There are so many reports of the ghosts of Gettysburg that the area has become a focal point for ghost hunters as well as Civil war enthusiasts. The Holiday Inn where I am staying although a relatively modern building, is also the scene of several sightings of phantom soldiers. Literally next door is the Jenny Wade house, famous for its haunted cellar, and there are several other reportedly haunted buildings within a few blocks along the surrounding streets. I was only in town for 4 days and had a lot scheduled, so after checking in to my Hotel I set off to take a ghost tour. 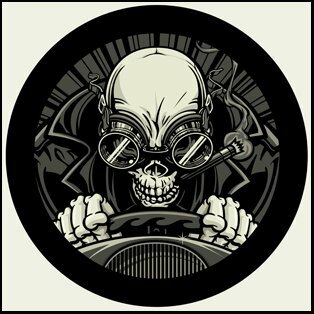 The Gettysburg haunting’s have become such a major attraction that there are now almost a dozen different tours, numerous books and videos, bus tours and even a train tour that focus on the to wn’s paranormal history. As I first entered via Baltimore Street I had already noticed several different groups of people each lead by a costumed guide along the dimly lit town center, which I assume were ghost tours, and with so many options it is advisable to do some research before you make your own choice. Aside from reading books on the battle, I had also rented several documentary’s, purchased 3 of the books from the Mike Nesbitt ghosts of Gettysburg series, as well Gettysburg a ghost hunters field guide by the same author. I even went so far as plotting and numbering the haunting’s on a tourist map of Gettysburg, there were over 30 different locations. 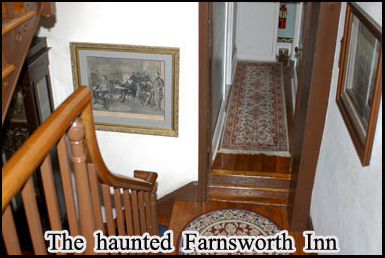 The tour I had decided on was the one that was based out of the Farnsworth Inn, the reason being that this is that it is the only one that will give you access to the haunted attic room of the Inn as well as a tour of the town. Even if you are a guest at the Inn you will not gain access to the attic unless you take the tour. I was staying right in the center of Gettysburg and everything is in easy walking distance. I made my way down the street towards the Farnsworth Inn, and as you would expect there are several restaurants in the area and many shops selling souvenirs and items related to the Civil War. At the time I was there, plans were being made for Gettysburg to have its first Casino and apparently many of the people living here were not happy with the prospect, as indicated by the protest signs in many of the residents windows. Although there is a McDonalds on the outskirts of town the centre of Gettysburg has been fairly well regulated to retain its character. I crossed over Baltimore street, along one side several of the older houses that were standing at the time of the battle have plaques outside depicting what there role was in the civil war, on the other side of the street are bed and breakfasts and a residential area. Next to the Farnsworth Inn, on the porch of a colonial style house is the meeting place for the ghost tours. Several are conducted a night, and the next one was in about 15 minutes, already there was a group of about half a dozen people waiting for it to begin. The guides are each dressed in Civil War era costumes and they each carry a lantern to lead the way around the dark streets. As the numbers of people grew the crowd was split into two groups. Within a few blocks there are several other company’s that conduct their own ghosts of Gettysburg tours and many of them have two or three scheduled a night, so it gets to the point that you may have half a dozen ghost tours and hundreds of people all out on the same narrow streets looking for ghosts at the same haunted places. You can of course buy a ghost book as most of the stores sell them and plan a tour to your own schedule, but it’s not going to be easy to do it without running into other tours, and there are still places that are going to be off limits unless you are part of a organized one. 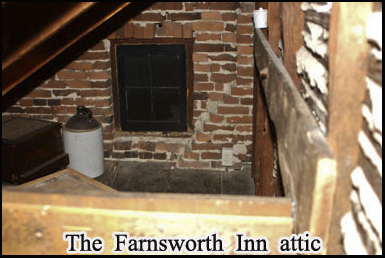 The Farnsworth Inn tour lasts just over an hour and a half and depending on if there is more then one group, you will either start with a visit to the attic or finish with it. In this instance this is where the tour starts. The Inn is one of the major landmarks in Gettysburg, and by reputation one of the most haunted. The guide led us along Baltimore Street past the front of the house, and then down South Street which borders one side. If you look closely you can see small holes in the walls, these were actually made by bullets fired during the battle over a hundred and forty years ago. The oldest part of the house originates from 1810, and there are several pictures of the aftermath of the three day conflict in which the building can clearly be seen in the background. At the time the surrounding area had not been developed as it is now, but much of the actual fighting did take place in and around the Inn. Confederate sharp shooters took up position in the attic of the house during the battle and this is one of the reasons that it is supposed to be so haunted. But it is not just the haunting’s in the attic that draws people here, it’s the fact that virtually every room in the house has been reported as having some sort of paranormal phenomena. The Inn has been featured on both the Sy Fy channel and A&E and in numerous other programs about the paranormal. In a few days time I would be staying the night here, and what occurred certainly indicated that the Inns reputation is justified. The guide unlocked the door at the side entrance of the house which once opened leads to a steep wooden staircase that goes up to the second floor. Being a popular bed and breakfast establishment there are several guests already staying here, but they do warn you before you book a room about the attic tours. We all went up the narrow stairway single file, along another corridor and towards the stairs that lead to the attic. Being old and wooden everything creaks and I’m sure this may account for some but certainly not all of the ghostly encounters in the house. There are two guest rooms downstairs next to the entrance, on the 2nd floor there is a communal lounge and several more rooms on the upper levels. Many of the rooms are named after someone that had an association with the Civil war including the Jennie Wade room the battles first civilian casualty, the Longstreet Room named after the Union General, and the Custer room named after General Custer who also fought at Gettysburg, the room I had booked was the Sarah Black room. The house is decorated in keeping with its history and you do feel like you are stepping back into another era. It’s not cheap to stay here, but if you’re interested in the paranormal it is worth the money even if it’s just for one night. The staircase to the attic angles up around to the right, past one of the guest rooms, the guide goes ahead to unlock the door, and everyone goes into the attic. There are some wooden benches to one side, a few civil war artifacts behind a glass display cabinet, and on one end of the room just to the right of the door is a the triangular shaped area that the confederate sharp shooters gathered in to fire at the enemy. The attic is long and narrow but doesn’t expand over the entire lower portion of the house, just the section that is nearest the front of the building. There are polished timber beams that run upwards throughout the length of the attic, and frame the single window at one end. Once everyone is inside the door is closed. The guide gave a brief history of the house, recounting the sharp shooter story and also some of the various paranormal encounters that have taken place in the attic including cold spots, and the sounds of ghostly gunfire; it is also believed that this was at least where one of the confederate snipers was killed. People in the Sarah Black room which is directly below have reported hearing footsteps coming from the attic in the early hours of the morning, long after the tours have left. The attic does without doubt have a strange atmosphere about it, but then of course it is small and slightly claustrophobic, which may account for such a sensation. After the tour guide had finished her presentation, we had a look at the artifacts behind the cabinet; these included what are known as pain bullets. These are actually bullets from the civil war that were given to injured soldiers to bite down on when the pain became too much. You can clearly see bite marks in them. After everyone had a turn at looking through the sharpshooter window we all went back downstairs and out onto the street to proceed with the rest of the tour. It was the middle of October and at this time of night it was getting quite cold. Our group headed along Baltimore Street , a few blocks away we were back at the Holiday Inn where I was staying, and this was pointed out as being the location that several phantom soldiers have been seen by the hotel guests. We proceeded along the opposite side of the street. There are several old houses and buildings, and one in particular was once an orphanage for children of the soldiers that were killed in the civil war, it is hear that the sounds of children crying have been heard. Beyond this you are getting to the outskirts of town and towards the main battlef ield. Here you are almost at adjacent to the national civil war cemetery where an apparition has been seen at the rear gates. However it could be said that everywhere you go in Gettysburg is a cemetery. Although great efforts where made to retrieve the dead from what were temporary burial sites on the battlefield, with the amount of fatalities it would be impossible for there still not to be remains scattered around the battlefield or beneath the houses that have since been built on top of it. We crossed back over the road and behind us to our left was East Cemetery Hill. This is where a fierce attack by confederate troops was repelled by Union troops on the second day of the fighting, on the crest of the hill are a clump of trees and there have been reports of soldiers being seen here as they march up the hill before disappearing. We retraced our steps a few blocks, and stopped at the Jenny Wade House. Jenny Wade was the only civilian killed in the town during the 3 day battle; it was believed she may have been shot by the sharp shooters positioned at the Farnsworth Inn. She died in the cellar of the house and this is where her ghost has been seen on several occasions. 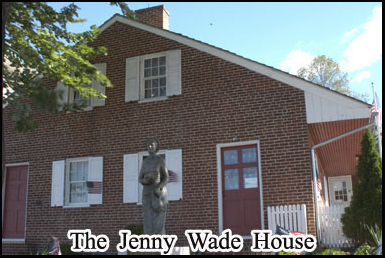 The owners of the Jenny Wade house also capitalize on its paranormal as well as its historical aspects, and hold midnight ghost hunts on the premises as well as operating self guided tours of the haunted cellar. We continued back down Baltimore Street which on one side becomes a residential area, and made a right along Lefever Street almost opposite the Farnsworth Inn. On one corner there is a high school and beyond that a small playing field with athletic track, there is a cluster of trees next to it and this is where we all gathered. At the far end of the field is a wooded area and beyond this is the East Cemetery Hill battlefield. There is a narrow lane that runs along side a row of houses, and this where nearby residents have heard the sound of marching feet, as if the battle is still being fought. We gathered around a large tree to one side of the field which was the final stop of the tour. People have experienced cold spots, and a feeling that they were being watched around this area. Several of the group took photographs hoping to pick up something. The tour ended and after everyone had dispersed I wandered across the field toward the tree line at the rear of the battlefield taking several photographs to see if I could pick up anything of a paranormal nature, but nothing occurred. It was about 11p m and I returned to the Holiday Inn which is a short walk back up the main street. I spent most of the following day touring the surrounding battlefields, and would be returning to some of the more haunted locations in search of the ghosts of Gettysburg later that night. 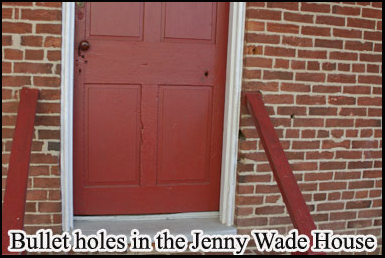 In the afternoon I took a detour to go to the Jenny Wade House, back in the town center. The house is fairly small composed of a few rooms and a cellar, and looks relatively modern from the street side. The building is right next to the holiday Inn and there is a statue of Jennie Wade standing out front to one side a tree which makes it fairly easy to find. There is a gift shop next to the house which is where you purchase your entrance tickets. The tour runs throughout the day, but after waiting for about 10 minutes to see if anyone else was going to be showing up, it looked like I would be just me on this particular one. The guide led me back through the entrance to the gift shop and around to the side of the house to point out some of the bullet holes still visible in the wall, the house was also hit by an artillery shell, but this failed to explode. At the time the battle was being fought, the union arm y was South of the house and confederate army was North. Just before you enter the house you will notice a hole in the rust colored side door , this is supposed to have been made by the bullet that killed Jenny wade, fired by a confederate sharp shooter on July 3rd 1865 the last day of the war. The tour guide lets you into the front room and points out the projectory of the bullet. There is light green door to the right hand side in front of the kitchen with a Perspex cover of the area where it continued on its path. 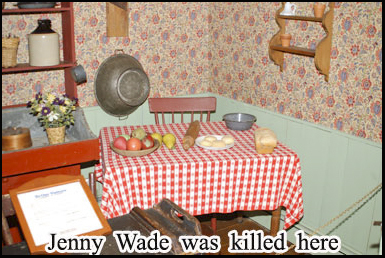 It was just beyond in the kitchen that Jenny Wade was shot while she was baking bread for the Union troops. The kitchen is sparsely furnished with an old oak wood table, a bread maker and some wooden shelves filled with cooking implements and old storage jars. Like the rest of the house the decor is as close to the style it would have been when Jenny Wade lived there, and most of the furniture is original. The tour guide gives a well presented history of the house, explaining that Jenny Wade was only 20 years old when she was killed, and that the building was once partitioned in order to house two families. It was not originally referred to as the Jenny Wade house, but as the McCellen house after the owners of the property at the time the battle. Jenny Wade lived there with her sister but as she became more famous as a result of her death, then the house was referred to in her name. She is actually buried a few blocks away in Gettysburg‘s Evergreen cemetery where her grave is marked with an American flag flying above it 24 hours a day. The guide finishes his talk, and leaves, after which there is a short automated audio presentation. I’m actually the only person in the building so I am now free to take pictures and explore the rest of the house. Some of the paranormal experiences that people have reported here include the smell of freshly baked bread, seeing the ghostly figures of children and experiencing cold spots. In the front room there is a large fireplace, which would have been the only source of heat, and it can get extremely chilly in Gettysburg and the battlefield is often covered in snow during the winter months. Next to the fireplace stands a mannequin of a union soldier and on the wall is a picture of one of the former occupants of the house. I made my way up the stairs; it’s very quiet inside the house even though you are not that far from one of the town’s main roads. The wood floors creak, and as you make your way up to the 2nd floor, you do start to wonder about what may be up there, particularly if you’re the only one inside. Upstairs is another fireplace and several bedrooms, in one of the rooms is a picture of Jenny Wade. The area under the eaves of the house has been utilized to provide extra space, and beneath one of the slopping enclaves, there are some children’s toys scattered across the floor, fenced off behind a length of chain. All the beds are of a dark heavy oak, fully made up with patchwork quilts. You get the impression that a great effort has been made to try and recreate the interior as it was when Jenny wade lived and died there. I walked over to the front of the house to peer through the top floor windows. Since the time of the battle other buildings have been built in the line of view, but I would image that a 140 years ago you would be able to see across much of the town and surrounding fields where the conflict was fought. I headed down the stairs and exited through a door at the rear of the house, this takes you out into the back yard and around to where the cellar is located. 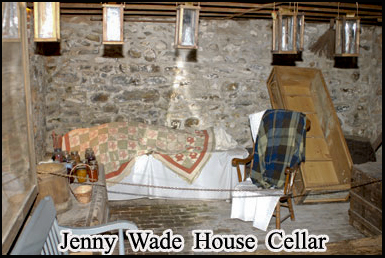 The cellar is supposed to be the most haunted part of the house, as this is where the body of Jenny Wade lay, while awaiting burial. This s is however somewhat contrary to the notion that the place that someone actually died will tend to be the most paranormally active, but being a cellar it is of course a more dramatic setting for a haunting then a kitchen. There are some white shutter doors a few yards down the path which are open to reveal a set of stone steps that lead downwards beneath the house. I continue on into the cellar, it’s a reasonably warm day out and the temperature drops quite dramatically as you leave the daylight. Below ground, there is a damp earthy feel to the room. It is fairly large and stretches under most of the length of the house above. The walls are made of flint and the floor is brick lined, but it’s high enough that you can easily stand up. At the time Jenny Wade lived here it was used for storage, now there are a few benches some civil war artifacts and photographs of some of the alleged supernatural activity that has occurred. There is even a certificate from a local paranormal investigation group that has declared the place to be genuinely haunted. 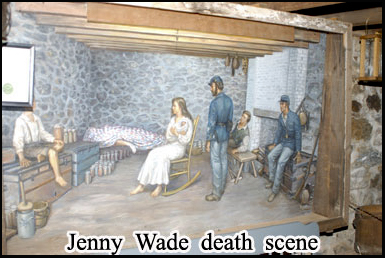 The focal point is however a recreation of the scene where Jennie Wades body lay awaiting burial. At the far end of the cellar at what is the street side of the house is a bench covered in a white sheet on top of which there is the shape of a body with an arm sticking out from underneath a patchwork blanket. Next to that is an upturned wooden box with some jars sitting on it and to the right is a rocking chair. But it is not so much this recreation that makes it unnerving, it ‘s the large painting on the wall on one side of the cellar. The painting also depicts the actual death scene, but because it was painted at the time it has more of an impact, and makes you realize that hundred and forty years ago there would have been a dead body just a few feet away. The inclusion of several Union soldiers also emphasizes the fact that during that time frame there would have been hundreds if not thousands of dead or dying soldiers in close proximity to the house as the battle raged on for its 3rd day. But maybe the reason Jennie Wade cannot find peace is that she didn’t have a permanent resting place for several months. Her dead body lay in the cellar for less then a day after which she was buried in the garden of her sister’s house. But then 6 months later she was exhumed and reburied in Evergreen cemetery where she still lies. The tour of the Jennie Wade house had been very interesting both from a historical and a paranormal point of view and I’m sure the cellar takes on even more of an atmosphere when it’s at night time. They do hold “spend midnight in a haunted house” events along with regular ghost tours so there are plenty of opportunities to try and experience the haunting here yourself. I headed back up the steps returned next door to my room at the holiday Inn. Tonight I was going to visit some more of the battlefields haunted hotspots after dark, and then tomorrow was when I would stay at the Farnsworth Inn. After another day of touring the battlefields and the outskirts of town I checked into the Farnsworth Inn at about 4 in the afternoon. I had passed it several times during the last few days as it is on the main street running through Gettysburg, and I was looking forward to spending the night there. 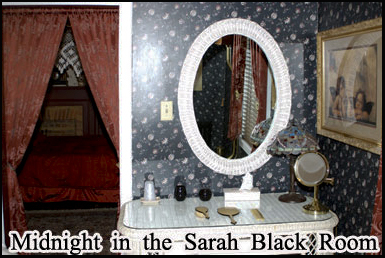 I had done a lot of research previous to booking my room and from all accounts the Sarah Black room where I was staying was the most paranormally active. If you’re searching for any of the ghosts of Gettysburg this is one of the best places to look. Sarah Black was one of the previous owners of the house but as far as I know she doesn’t haunt it although there are many others that do. I parked the rental car next to the alleyway that runs past the rear of the property. There is a civil war book and souvenir store next to the Inn which is also where you check in. I had reserved the room several weeks in advance, and if you want a specific room particularly a haunted one then it’s advisable to do so. One thing of interest is on the booking receipt, it actually states the “the use of Ouija boards is forbidden on the premises”, which is not a regulation that you will encounter at most Bed and Breakfasts or Hotels. 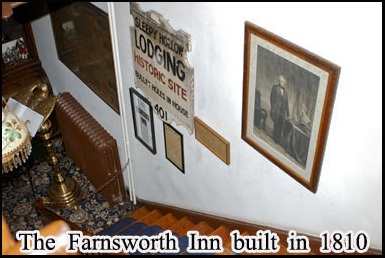 The Farnsworth Inn is quite open about the fact that it is haunted, referencing it on its official website, as well as being featured in virtually every book or T.V program about the Gettysburg Haunting’s. The staff are very welcoming, and will be more then willing to offer advice on what to see and do in the area during your stay. Once I checked in, I was escorted to the entrance of the Inn, w hich is on the side street at the rear of the property. I had one suitcase with me with me but still had some more camera equipment in the car that I would collect after being shown to my room. I glanced into the small communal lounge area just after the stairs, there were a few people in there, but most of the guests where still out touring the town or battlefield as it had been sunny most of the day and there were still several hours before it got dark. The house is composed of narrow passages, all on slightly different levels to each other. The lighting is fairly dim as the main corridors are internal without any windows; and sound seems to echo across the wood floors. My room was just before the stairs to the haunted attic at the front of the house. The receptionist unlocked the door switched on the light and showed me inside, it is slightly small but was immaculately furnished, had a old wooden four poster bed, a plush red chair to sit in, and a view across Baltimore street. He led me across to the bathroom switching on the light so I could see the old wrought iron tub, and a dressing table. The bathroom was actually fairly spacious, but the two rooms do adjoin each other and have no separating corridor. True to the time period there is no TV or phone. The man explained that breakfast was served between 8 and 8.30 am and that I could get to the dining room by taking the stairs outside to the right of the room, which although they were alarmed at night could be used in the morning. There are no staffs staying in the house just guests, but there is a contact number in case of any emergencies. The receptionist handed me the key, I put my luggage on the floor by the bathroom door and then lay on the bed for a few minutes. To one side there is actually a white dress maker’s mannequin, and I couldn’t help but wonder how many people had woken up in the middle of the night and half asleep think they had seen a mysterious ghostly figure at the foot of the bed. The room does have an official ghost and there is a plaque on the wall explaining the apparitions that have appeared here. While no one actually died in the room, a young boy w as knocked over in the street outside and brought here, jus before he died. The ghost of a man in a top hat has been seeing standing over the foot of the bed, and there have also been reports of footsteps coming from the attic above which is supposed to be made by ghostly confederate sharp shooters. The room doesn’t feel that eerie, certainly not in the daytime although when you are in it alone without a TV set or phone it is abnormally quiet. After a few minutes rest, I decided to make the short trip back to the car to collect the rest of my luggage and camera equipment. One thing I always do when I stay in a haunted room is make a mental note of where everything is, if any doors or windows are open or closed, whether the lights are on or off, and the location of my personal belongings just in case anything does move by itself. I also take several base line photographs of the room which is what I will be doing as soon as I collect the camera equipment. Something else I do is leave the lights and the T.V on if the room has one as a security deterrent as I normally have a lot of expensive camera equipment with me. I opened the bedroom door, checked that it was locked securely behind me by wiggling the handle, and then went back to the car. The car park is just to the rear of the house a few minute walk away. I collected the rest of my equipment and was back at the entrance to the bedroom in less then 10 minutes. I opened the door and immediately I noticed something was different, the bathroom light was off. The bathroom has very little natural light and is slightly gloomy, so you notice the contrast between that and the bedroom straight away. Of course a light bulb going off is not that unusual, neither is a electrical fault in the wiring, so I walked to the bathroom with the intention of flipping the light switch on and off a few times to see if that would get the light back on. But what I saw was that one way or another the light has been physically turned off as the switch was down. I can’t say I was frightened but I was certainly surprised, it was the afternoon of a sunny day and I had only checked into the room about 15 minutes ago, and I hadn’t been anticipating any sort of paranormal encounter if this was one, so soon. I certainly didn’t feel any sort of presence, and as soon as flipped the switch up the light went on. I tapped it with my fingers, seeing if it was anyway loose, it wasn’t, in fact it was slightly stiff and required more then a minimal pressure to move it. The light also wouldn’t go on or off until the switch had been fully implemented up or down, not just part of the way. So there are three options, the switch was moved by human intervention, by some sort of paranormal force or I was mistaken in thinking the light was left on. I am a 100% positive the light was on when I left the room, there are certain rituals and procedures I have followed for years to eliminate such mistakes and I also remember the receptionist physically switching on the light and have no recollection of either him or me switching it off. Bare in mind that this all happened less then 15 minutes ago, so my powers of recollection were still very strong. The other possibility was that it was moved by human intervention, or if that could be eliminated then that the occurrence may have been paranormal in origin. Although I was gone for less then 10 minutes, this would have been enough time for someone with a key to go back into my room, and then switch the light off. Firstly this would mean that who ever did this would have to be waiting somewhere out of sight until I decided to leave the room, however they would have no way of knowing if I was going to leave in the next few minutes or if it would have been hours. They could have made an assumption that I would be returning to my car soon after I checked in if I had no baggage with me, but the vast majority of people that check in to a hotel do have their baggage with them, just as I did. They would also not have known how long I was going to be away, it could have been 10 minutes, it could have been several hours or it could just have 30 seconds while I went a few yards down the corridor to see if there was anyone in the communal lounge. Secondly if you’re going to all that trouble just to switch off a light, why not pick the main light in the bedroom which would be more noticeable and more easily accessible as you could just open the door, and switch off the light without even having to walk through to the bathroom. Also why just switch off a light, as many people would just assume it was just a bad bulb, and most aren’t going to be aware if the switch was down or not. There were many objects in the room that if moved couldn’t have been overlooked such as the children’s toys, or the top hat on the corner of the bed post. Why not place one of these objects in the middle of the room if you’re going to go to the trouble to fake something, far more spectacular and far more noticeable? I switched the light back on and started to unpack some of my camera gear. I also have a small travel radio that I take with me, as there is no T.V in the room I lay on the bed and switched it on. I had been listening to it for less then 5 minutes and then suddenly it went completely dead. I had placed new batteries in it yesterday, and also the time on the clock face did not go into reset mode, although it runs off the same battery as the radio. I’ve used this travel radio for over two years and never had this happen. The on / off switch is a button, not a dial, I pressed it once and the radio went back on. Although the radio had been stationary when it went off, I shook it to see if there was some sort of lose connection that may have been causing it to malfunction, which there wasn’t . When at a haunted location part of the equipment I take is a battery tester, as there have been numerous accounts of paranormal investigators having the batteries in their electronic equipment drained. I tested both batteries from the radio and they registered at full charge. The radio didn’t shut off again that night and hasn’t done since. Again I felt no change in the atmosphere in the room at all; no temp erature drops and no feeling of being watched or that someone else was present. Having two incidents occur in such a short space of time, I decided to go and report my experiences to the staff at the reception desk. They did not seem in the least bit surprised, but just referred to them as “Simon playing games”. Simon is apparently the name given to the ghost that they believe is responsible, for these occurrences and one of the things he likes to do is switch the lights on and off. For me it was something very unusual but if you work in one of the most haunted buildings in one of the most haunted places in the world apparently it isn’t. I returned to the guest house, and waited till it got dark. Later I was going to visit some more of the battlefield, and so would be out of the room for a several hours. As I had to fly to Gettysburg I did not have room to pack all my equipment but I did have 2 Trifield meters, one A.C and one D.C, some digital thermometers with built in alarms and a couple of video cameras with night vision. I dont use the meters or thermometers to detect ghosts I just use them as environmental monitors. I also had two tape recorders, and a set of playing cards that made up the letters of the alphabet. I had also just purchased an item I could use as a trigger object, in this case an authentic bullet tip recovered from the battlefield. I did a base line test of the room, with both the A.C and D.C electrical magnetic field meters, and took some video and still photographs. I placed the trigger object on a piece of paper and drew around it to mark its exact location, so it would be easier to determine if it had shifted position while I was away. I placed the AC and DC meters several feet apart and then spread out the set of cards in a line. I inserted an external mic into each of the digital tape recorders, erased the contents of both of them before switching them on. Next, I wrapped one of them in brass mesh, the reason I do this is that brass mesh blocks any stray radio waves that could give false E.V.P readings. This basic precaution acts as a simple “Faraday cage” and I have placed both a radio and cell phone in the same insulation to test its functionality and it blocks both signals instantly. I left both recorders a few feet apart on the bedside table, then I set up a Sony camcorder with external infra light that would cover the centre of the room where the trigger object and meters and cards were. Finally I asked if there was anyone present if they would make a sign, move something or say something while I was away to let me know they were there. I left the room, locked the door and didn’t return for about 3 hours, while I went to Devils Den and Spangler’s Spring. I returned to my room at about 11 pm. The lights where still off, and after switching them on I could see that nothing had been moved. I turned off the tape recorder and video, which I would review at a later date. I checked the min\max settings on the thermometers and they showed no abnormal temperature fluctuations. It was all quiet; it was a Sunday night and outside there were few cars on the streets and the last of the ghost tours had ended some time ago. Suddenly I started hearing footsteps that sounded like they were coming from inside my room. I listened for a moment and I could also hear voices, but they were coming from the room next to mine. I noticed the volume of the voices increased slightly as the footsteps got louder, and it was soon apparent that the origin of the footsteps were entirely man-made. Because of the acoustic properties of the wood floors it did sound for a moment that there was someone in my room aside from me, and I’m sure that may account for at least some of reports of ghostly footsteps that have been heard in the building. It was now midnight; I left the E.M.F meters and digital thermometers on overnight, as they all have built in alarms which will sound if there are any fluctuations below a certain point in the base readings. I also left a camcorder ready on the bedside table. 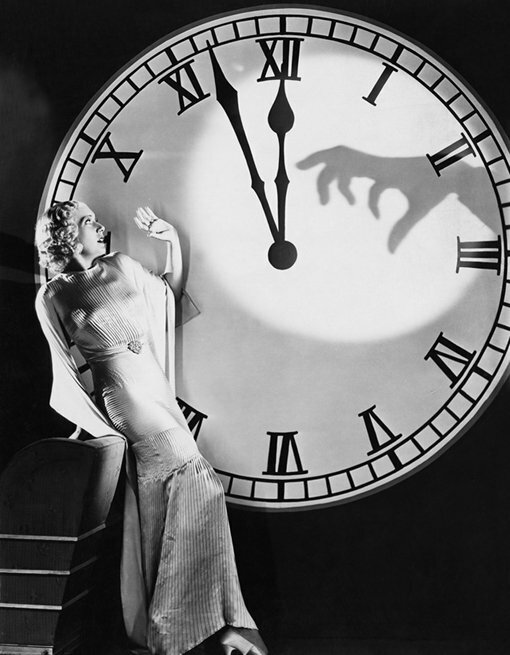 By this time most people had gone to sleep and the house was still. At bed level in semi darkness the white dress mannequin on the left hand side does look like a women with no head, and I’m sure it has given a few or the rooms occupants some restless nights. I fell asleep for a few hours but then at about 2 am in the morning I awoke, the first thing I saw was the white mannequin but that was not what disturbed me. I could hear what were footsteps coming from the attic above, and they sounded like they were being made by a person. It was as if someone was walking across one side of the attic, stopping, then walking a few more paces back the way they came and then stopping again, and it certainly didn’t sound like an animal scurrying across the floor. This went on for about a minute then I didn’t hear them anymore. The house does have acoustics that carry sound, but there isn’t a room adjoining the attic and the footsteps I just heard were distinctly different from the footsteps I had heard earlier coming from room next door. Being in the early hours of the morning the temperature has dropped and in a house with wooden floorboards they will creak and contract, but I’ve heard what this sounds like before it was certainly not the same. I eventually went back to sleep and woke at about 7 am, none of the alarms on the monitoring instruments had gone off, and nothing had been moved in the room. An hour later I went downstairs for breakfast. You enter the dining room via the internal staircase, which is accessible during the daytime. Most of the other dozen or so guests were down there already. I found a table near the window. Not surprisingly the talk was of ghosts and I was able to overhear several conversations about people’s encounters in the house the previous night. Several talked about hearing footsteps in their room, but most interesting was that someone had said their door was rattled in the early hours of the morning and when they went to see if anyone outside there wasn’t. No one else reported hearing footsteps in the attic, but the room I’m in is the only one directly underneath it. 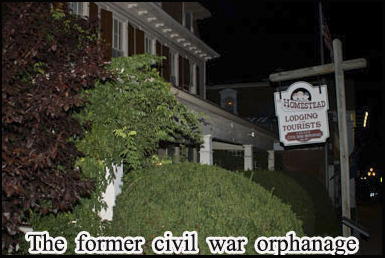 If you are going to Gettysburg because of an interest in the paranormal make sure you stop off for a night at the Farnsworth Inn, and make sure you book a room in the older part of the house, not the newer extension. The Inn lists what it considers its most haunted rooms on their website. 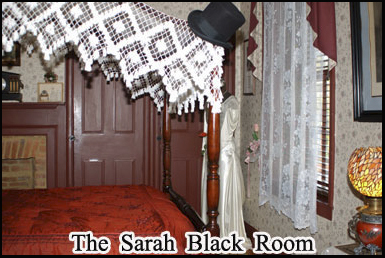 A few days after my return from Gettysburg I reviewed the video and E.V.P’s I had taken in the Sarah Black room, but there was nothing of significance on either of them. This is part one of a two part report about my trip in pursuit of the ghosts of Gettysburg, part 2 covers my visit to over a dozen haunted locations throughout the battlefield including Sachs Bridge and the East cavalry field. Also covered will be nighttime reports from Devils Den, Little Round top, the Wheatfield and Spangler’s Spring on what was the last month before new curfews where put on the park that no longer allow late night excursions into the battlefield. 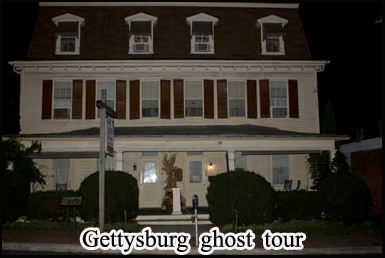 Hey Buddy!, I found this information for you: "Ghosts Of Gettysburg – Haunted Pennsylvania". Here is the website link: https://www.chasingmidnight.com/ghosts-of-gettysburg-haunted-pennsylvania. Thank you.